A soldier lies wounded on the battlefield. The hero hesitates between rushing in to save him and jeopardising the rest of his troop or leaving the wounded man to die. In the end, he rushes in but sacrifices a number of his men in the rescue attempt. Well, this dilemma will be a thing of the past. 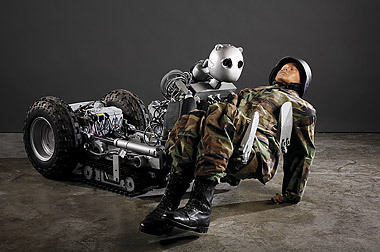 The United States army has developed a robot which can recover injured or abducted soldiers from enemy territory. The remote controlled Battlefield Extraction-Assist Robot (more tenderly known as BEAR) can pick up and carry a man in its robotic arms across unfriendly ground. It can also retrieve light or heavy equipment from the enemy camp.It has a rounded head, ‘teddy bear’ ears, and round panda-like eyes. Its arms can carry more than 135kg of burden. It is fitted with special legs and wheels to enable it to climb stairs, travel over rough terrain, or skate over smooth surfaces. Computers linked to gyroscopes control the robot and prevent it from falling over. BEAR will be ready for field tests in about five years. Meanwhile, the military might consider perfecting the appearance of the robot so that it looks more like a human being to enable it to slip unnoticed into top-secret places.